Pinellas Suncoast Transit Authority CEO Brad Miller presents the Safety Excellence Award to Palm Tran’s Safety and Training Officer Jafari Bowden, Director of Operations Sean Smith, and Executive Director Clinton B. Forbes. 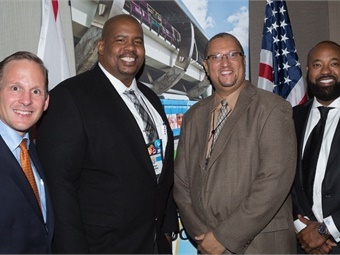 Palm Tran received three prestigious awards from the Florida Public Transportation Association during its annual conference held in West Palm Beach. The conference honors innovative transit leaders throughout the state and was co-hosted this year by Palm Tran and Tri-Rail. 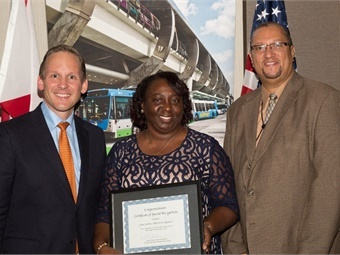 Bus Operator Joan Jenkins (center) receives Special Recognition in the category of Bus Operator of the Year. Palm Tran placed third overall in the Sustaining Campaigns category for its Bus Operator Uniform marketing campaign. The $10,000 campaign used bus operators as models to create a bus wrap showcasing Palm Tran’s “new look, new uniforms, new day” slogan. The campaign included posters, interior bus signage, and digital screen infographics to spread awareness further. The content received 544,000 views every four weeks by people in the community. Bus operator Joan Jenkins received Special Recognition in the category of Bus Operator of the Year for her response to two critical emergencies with high professionalism. Jenkins ensured passengers were safe after a bomb threat was received and swiftly responded when someone brought a gun on board a Palm Tran bus. During both incidents, Jenkins calmly followed emergency procedures and ensured everyone’s safety. Additionally, Palm Tran’s Safety and Maintenance Team received the Safety Excellence Award for implementing a new program to retrofit buses with “flashing lights” on the vehicle’s tails – this led to a reduction in rear-end collisions. Within a few months, Palm Tran reported no rear-end collisions involving the buses with rear flashing lights.